What are the enemies of your battery? How to handle/install/remove a battery? How to properly charge and store a battery? What to think about before buying a new battery? Just like when investing in a brand new dirt bike hitch carrier, acquiring a battery for your bike is a complicated process. To make the right decision, it is advisable that you spend some time reading info on this topic, as getting the correct battery can be critical to the bike’s overall performance. The first type of batteries used for bikes are flooded acid batteries. Currently, a biker can pick between traditional, flooded models, and absorbed glass mat batteries. These latter units are maintenance free and completely sealed. Both absorbed glass mat batteries and the traditional ones are lead-acid models. Still, the absorbed glass mat units differ from the flooded batteries because they use an electrolyte solution that is maintained in a glass mat and, thus, it does not slop around as it happens in a flooded battery. A battery is a device that converts chemical energy into electrical energy. Each model is made of individual cells that can produce between 2.11 and 2.20 volts each. These cells are made of alternately charged negative as well as positive lead plates that are arranged interchangeably negative, positive, negative, etc. In a flooded battery, insulators are placed between the cells. As the plate surface area increases, so does the current. Therefore, the more plates are in a cell, the bigger the flow of electricity that is generated. Firstly, heat. It is a well-known thing that excessive heat (more than 130 Fahrenheit degrees) reduces the longevity of one’s battery. Even more so, it has been proven that a battery that is stored at 95 degrees will discharge twice as fast as a model kept in an environment where the temperature measures 75 degrees. To put it in simple terms, as the temperature rises, the discharge rate of the model does too. So, without exaggeration, heat can, therefore, damage a battery. Freezing is another enemy that you should not neglect. As the discharging process occurs, the electrolyte acid is turned into water. If the temperature is below 32 Fahrenheit degrees, the acid will freeze and, as a result, there is a chance that the case and the bucket of the plates will crack. To avoid this, whenever it freezes, you should simply chuck the battery. Yet, it is worth pointing out that this only happens with inadequately charged batteries. If your battery is fully charged, you can store it at sub-freezing temperatures without fearing that it will be damaged. Sulfation should also be avoided. This process occurs because of low electrolyte levels or continuous discharging, as excessive discharging can turn lead plates into sulfate crystals. This should not be an issue if electrolyte levels are maintained and the battery is correctly charged. Another important battery killer is vibration. Because of this, it is best that you take the time to inspect the mounting hardware and to install extra bumpers and rubber supports so that the battery box is kept in place at all times. Whenever handling a battery, it is recommended that one wears safety glasses and gloves. For extra protection, it is best that you do not hold the battery against your body, as any spilled substance can damage your clothes and/or skin. When replacing a battery, you should first disconnect all cables. Any old battery that you no longer use should be returned to the place where you purchased it from so that it can be recycled appropriately. Also, if the insulation is damaged by corrosion or acid, you should replace it. The new battery should be placed in the holder, and it should be secured in place. Connect the negative cable and the positive one to the appropriate terminal. 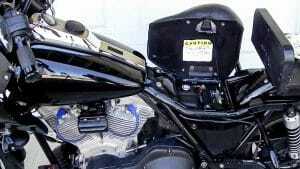 Finally, tighten the bolt/nut/screw to the appropriate battery specifications. 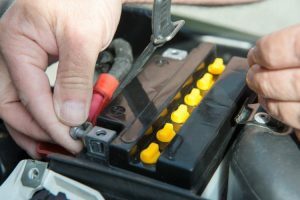 Correct maintenance and storage practices can ensure the reliability and longevity of the battery. All batteries that are only partially charged when put in storage can experience permanent damage and there is a chance that they will not recover. Plus, chronic under-charging can lead to excessive sulfation deposits. These deposits will not break down when the battery is normally charged. In addition to being properly charged, a battery should also be stored at the right temperature. 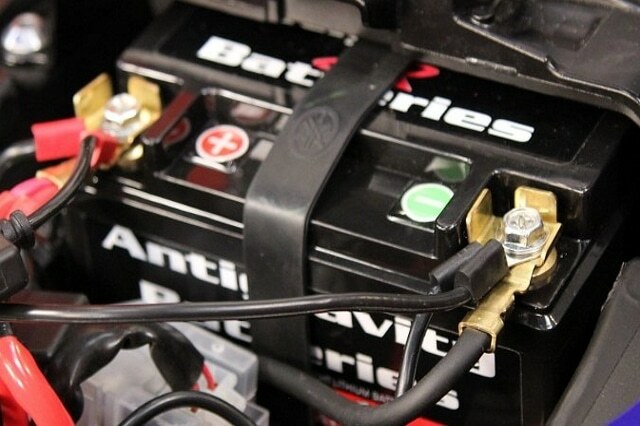 This is especially important when it comes to storing the battery during the winter. Because all batteries have to be charged and stored in accordance with their particular specifications, you should read the manual provided by the manufacturer. First of all, you should assess whether or not the model that you like is compatible with the bike that you own. Not all batteries are universally compatible. To narrow down your possibilities, it is recommended that you take a look at your bike’s specifications. Warranty is also important. If you want to be supplied with the best value for your money, you should pick a product that is covered by an extensive warranty policy. This way, you can avoid having to pay extra money in order to repair it in case it breaks or it does not function accordingly. If you do not have the time and the patience to deal with an option that requires too much effort to maintain, it is advisable that you pick a product that can function for a long time without needing maintenance. The power rating of the item is also fundamental, as a product with a high power rating is indicative of the performance of the battery. This rating is expressed in volts. While a high power rating is preferred, this kind of item is generally quite expensive. Last but not least, a good way to decide on a model is by reading the reviews left by prior buyers. By doing so, you will get a better understanding of the reliability of the battery that you like.